Being a rock n’ roll girl first and foremost, I’ll tell you that the worst musical shows are those where a guy thinks that the girl is really going to love the event, as it’s usually filled with emotion, tearful stories, witty banter between each song, and endless string tuning. 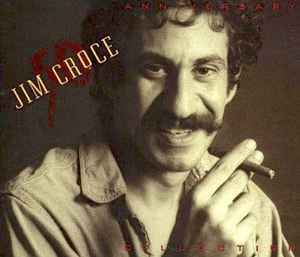 Case in point, Jim Croce, with his dynamically big mustache, curly hair, chest tattoo, eternal cigar, pensive eyes and cocky smile. Even though the man was a neighbor of sorts, he came from a slightly older generation, the folk generation, the one that liked to playfully twist words, fill songs with double entendres, and perpetually seemed to have a broken heart from making poor or selfish life choices. So you can imagine that it was a surprise to say the least when this collection arrived at my door, as it’s been a very long time since either of his two hits, which are included on this outing, filtered from my FM turner, as I never owned album by the man. Now ... I’m in no way saying that the album or Jim Croce are not good, what I am saying is that I don’t particularly enjoy this sort of music, music that for the most part seems to have been crafted to pluck at your heart stings with songs designed to evoke a tear from collective relatable painful memories. Yes, if anyone ever fitted the descriptive genre title of singer songwriter it’s Jim Croce; though I for one would like to see that genre title tossed out the window, as anyone who ever wrote and sung a song is a singer songwriter. Of course many who are reading this are going to link arms and try and tell you that Jim Croce and James Taylor are cut from the same cloth, but that’s just not true, for the most part James Taylor was a rockin’ bluesman who’s stories seemed more firmly rooted to the earth, and less etherial and emotionally structured than those by Croce. And yes, all of this was running through my mind as I looked over the track listing, thinking that I knew a mere handful of these numbers, so perhaps I was in for a treat. But no ... my initial memory remained intact, these songs are to be played in the background during dinner, quietly around a campfire, and would certainly draw the good times out of any momentary buzz one might be sporting. At the time Jim Croce was creating these songs, they where the sort of Harry Chapin “Cat’s In The Cradle” numbers that your parents could relate to, and it was certainly no surprise to come home from college to find a Jim Croce album mixed in with your parents show tunes collection, as if they were trying to hide it. These songs were lost on me, they were not part of the counterculture, they were not political, and there were few that lived on in my head after hearing them. Yet all and all, I suppose this music does have it’s fan base, does have it’s place, and to be completely honest, all of the songs were recorded and played well. It’s just that time never got stuck in a bottle for me, sure I’ve gotten older, but unlike my friend Steve who sold weed and acid during college, and to whom I gave this collection to, I never made the step from the madness of a rock n’ roll event to seeing Barbara Streisand and her endless final tour in Las Vegas, and for whom Jim Croce would have been a splendid opening act had he not died in 1973. So, take this collection of fifty some songs for what it is, and if you like them, play them, let Jim Croce rip your heart out and send it off into the ether mixed with his swirling cigar smoke. I simply wish that I had not allowed myself to contend with these memories.